King’s Stanley Church of England Primary school is a school that aspires to high academic standards with a strong emphasis on the other important things in life such as art, sport, drama, cooking, music, growing vegetables and having fun. The school has been awarded the Gloucestershire Healthy Living and Learning Award (2018 -2021) and the Sports Mark. We have long standing links with Kavuka, a school in Kenya. Although firmly at the heart of the village of King’s Stanley several of our pupils come from Stonehouse, a mile away and Stroud, three miles away. 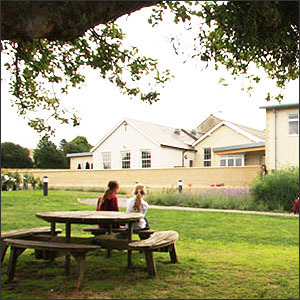 Many of the parents use the excellent Kingfishers Club for before and after school child care. This is based in the school building and several of the staff are also school staff. The school has children from the age of 4 to 11 who are taught in seven single-aged classes. At present there are 213 children on roll and we are typically oversubscribed. At King’s Stanley there is a strong emphasis on each child achieving their potential whether they are high achievers, have difficulties with their learning or whether they are particularly talented in some way. We are very careful to give the children the opportunity to be involved in the running of the school. The School Parliamemt play a leading part in decision making in the school. They were the ones who came up with the strap line to describe our school, ‘a place where we care about our learning and each other’. The parents, families and friends of the school provide wonderful support for the school. We have committed, caring Governors and a wonderful PTFA that organises fun fund raising events for everyone. If you are interested in your child joining our school then just ring or email and we will arrange a time for you to visit. Copyright © 2019 King’s Stanley C of E Primary School. All Rights Reserved.